Mental ill-health and unemployment can often be closely linked. Cheshire West and Chester Council has commissioned Healthbox CIC to deliver their Rapid Access to Psychological Therapies contract at Winsford Work Zone which is part of the Public Services Hub at Wyvern House. This service offers counselling support to clients who have been directly referred by the Work Zone due to their mental wellbeing acting as a barrier to their employment prospects. One man who has benefitted from this counselling service is Ian Sutcliffe, 51, from Winsford. To the average person, Ian came across as a happy man, content with his life, however, on the inside it was a different story. Ian said: “I had anxiety, depression and angina. I couldn’t work in a cold environment because of my angina. My job at the time was in a meat production warehouse, working within a cold environment so I had to leave that job last September because of my health. “Things just snowballed. My depression got worse. At first it was fine but after a couple of weeks it was a case of ‘what am I doing?’ My head just went. I was in a dark place at that time. On the outside I looked all happy and bubbly but inside I was destroying myself. I stopped taking my diabetes medicine and let myself go really. Back then it was a dark place and I am much better now. “I came into Wyvern House to sign on originally, to get Universal Credits at the Job Centre and my Job Centre advisor put me in touch with the Work Zone and I got my CV done and everything just got better from there. 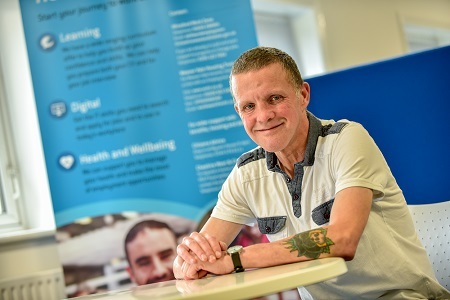 Alongside doing courses to improve his skills, the Work Zone staff referred Ian to Healthbox for some counselling support for his depression and anxiety. Ian said: “Healthbox have helped me immensely. I was carrying around a lot of emotional baggage from my past. It has made me think about what was there and the last couple of months I have been feeling better and better. “One of my defences was saying ‘I don’t know’ and it was my way of saying I’m not interested, go away. I’ve now realised that I do know what’s going on and am able to take control of my situation. I think about things more now and the counselling helped me with tools and techniques to work things out for myself and my life has really improved. “I think it is fantastic that all these organisations at Wyvern House working together. Before I came here I didn’t know what I was doing. I didn’t know what help was out there or where to turn. The Job Centre referred me to the Work Zone, and they pointed me to Healthbox. They talk to each other and they really helped because they direct you to where you have to be. Then it is down to the individual whether to accept the help or not. They do work hard to help you. You get out of it what you put in. For information about the Rapid Access to Psychological Therapies service, visit the Winsford Work Zone at Wyvern House Public Services Hub.